Cynthia D. Ritchie is one of a handful of ‘Gora Pakistanis’ –Caucasian Europeans and Americans who have joined the effort to improve Pakistan’s image, presumably for some consideration. None of the ‘Gora Pakistanis’ are particularly well known in their own countries. In fact they are non-entities. But they are a regular feature on Pakistani media and social media, selling the ISPR-PTI narrative that Pakistan’s beautiful landscape and the hospitality and kindness of its people should somehow give it a pass over terrorism, nuclear irresponsibility, money laundering, lack of democracy and human rights, and other issues over which Pakistan is criticized by the rest of the world. ‘Baji Cynthia,’ as she is affectionately known by her followers, has often attacked Pakistani human rights activists and liberals. Therefore, it is not surprising that last weekend, Cynthia Ritchie ended up on stage with a Pakistan military propagandist who has been put on a Specially Designated Global Terrorist list by the government of the United States –the country whose citizenship Ritchie leverages to gain importance in Pakistan. One year ago, the United States designated Tabish Qayyum a Specially Designated Global Terrorist pursuant to Executive Order (E.O.) 13224, which targets terrorists and those providing support to terrorists or acts of terrorism for his affiliation with Jamaat-ud-Dawa/Lashkar-e-Taiba. Tabish has a long association with Jihadi psychological operations and attended Pakistan’s National Defense University (NDU), where several such Jihadis have been educated in recent years. He was also named the Information Secretary for Hafiz Saeed’s political party, Milli Muslim League, when the Pakistani establishment tried to ‘mainstream’ terrorist organization Lashkar-e-Taiba (LeT) as a political party. 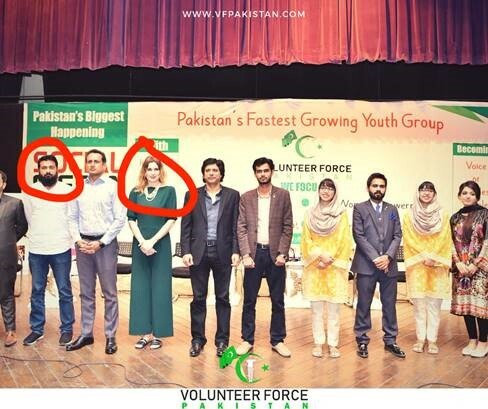 Given Cynthia D. Ritchie’s general ignorance about history as well as politics of Pakistan, it would not be surprising if she did not know that she was on stage with a designated terrorist facilitator. She describes herself as ‘World Traveler. Communications Consultant. Producer.’ Ritchie has yet to complete her Master’s in Strategic Communications from George Washington University and, except a strong social media presence and occasional articles in Pakistani media, she has no serious track record as a Communications Consultant. Pakistan’s Inter-Services Public Relations (ISPR), which has recently been humiliated over its fake Facebook accounts, needs to explain its embrace of Cynthia D. Ritchie. And Cynthia D. Ritchie must explain why she ended up on the same stage as a person whom the United States considers a Specially Designated Global Terrorist. This entry was posted in Uncategorized by Chaudhry Rasheed. Bookmark the permalink.